Although a Yangtze River cruise takes guests to a variety of destinations, one of the excursions well worth the visit is to the Three Gorges Dam. This hydropower dam is the largest in the world. Being able to use water for generating power is vital to the Chinese people. Unfortunately, the construction of the dam displaced more than one million people from a number of nearby towns and cities. Initially, Three Gorges Dam was the vision of Sun Yat-Sen dating back to 1919 but only in April of 2009 was the dream to become a fully functioning reality. Today, some scientists, engineers, researchers, and world governments have raised concern over the Three Gorges Dam, believing this project is a disaster waiting to happen. However, other experts have helped fund the project, believing it is an example of how hydropower can be used for generating power on a massive level. Already, 30% of the cost for construction has been recouped, estimated at 39 billion USD, with the dam having a capacity of generating 300 TWh of electricity. Consisting of 32 primary generators, this dam has stamped a place in history specific to engineering. The massive turbines are specially designed to help navigate the flow of the river, improve electricity production, lower risk of downstream flooding, and even reduce greenhouse gases. One of the main challenges for the Chinese people is the high degree of pollution. To help cut back on the amount of coal required to generate electricity, the Three Gorges Dam has a significant and positive impact, reducing coal usage by more than 30 million tons! In addition, water pollution is another serious problem in China. With the development of new water treatment plants, as much as 65% of dumped water is treated. 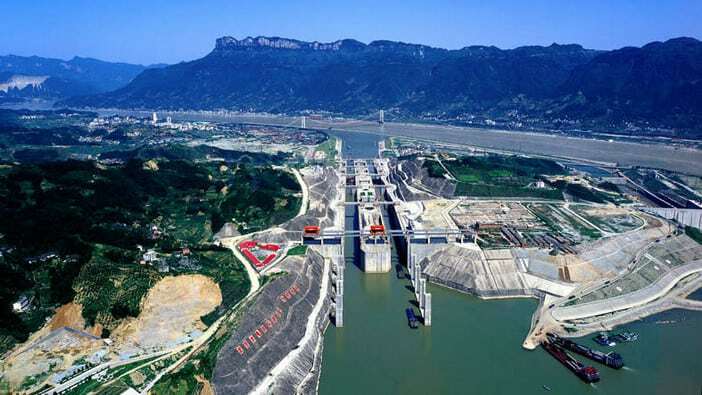 Keep in mind, cities such as Nanjing, Shanghai, and Wuhan where millions of people live are located downstream from the Three Gorges Dam and with farming being a prime industry and resource throughout China, being able to control flooding is imperative. With the new dam, experts state that major flooding to these and other cities would be dramatically reduced. This way, past flooding to include the 1954 and 1998 Yangtze River flood would be avoided. The design of the Three Gorges Dam is unique, divided into a left and right side, allowing water to flow from the top left to the bottom right portion. As you look at the dam, you will only see the impressive structure but not the underlying components to include the underground power plant. The wall of the dam was built from 35,600 cubic yards of concrete, as well as 456,000 tons of steel. To give you a perspective, the materials used would have been enough to construct 63 Eiffel Towers! No matter the controversy that may involve the Three Gorges Dam, this is a site worth visiting. The dam stretches 7,661 feet long, 331 feet high and 377 feet wide at the base, towering over nearby cliffs and peaks that reach more than one mile high. Controlling the Wuxia Gorge, Xiling Gorge, and the Outang Gorge, the Three Gorges Dam plays an important role for the Chinese people. In addition to controlling the Yangtze River, the third largest river in the World, you will find the view from the dam simply stunning. 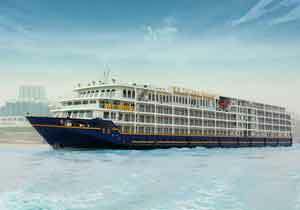 Three Gorges Dam Cruise can be booked with Yangtze.com, Yichang airport has about 10 flights a day in/out major airports in China.